Lee began his career with the youth team at Wimbledon, progressing to the first team where he became a regular on the bench. 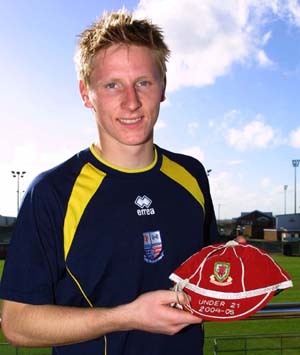 He made several appearances for the Wales Under-18 and Under-21 sides and during his time in Milton Keynes, went out on an emergency loan at Wycombe Wanderers in April 2004. With the appointment of former Wimbledon coach Ernie Tippett at Nene Park, he was offered a contract with Rushden & Diamonds during the summer of 2004 as understudy to Billy Turley. Appearances were limited until Turley’s suspension in December when he became the first choice keeper, but after a succession of defeats, loan keepers were brought in and he made his final appearance for the club in March 2005. Cardiff City signed him the following season, but he was limited to just a single appearance in the Welsh Cup and he went out on loan to Merthyr Tydfil during his time there. Lee returned to his birthplace in July 2006 to join Eastbourne Borough on a monthly contract, before joining Hastings United in October signing for 1½ years in January 2007. He left Hastings United on 16 May 2008 and joined Isthmian League Premier side Tonbridge Angels, helping them to promotion into the Conference South in May 2011. He signed a new deal in March 2012 to keep him at Longmead until the summer of 2013, but despite being offered a new contract, Lee made the decision to leave the club on 12 May 2013, after five seasons with the club, joining newly promoted Isthmian Premier side Maidstone United three days later. He was still in the Maidstone squad for the 2018/19 season.